One of the many highlights during the annual Epcot International Flower & Garden Festival at Disney World is called Minnie's Magnificent Butterfly Garden. The garden is populated with over 500 butterflies that are native to Florida in a special enclosed gazebo that guests can walk through. While walking through the 40 foot diameter display area ten different species of butterflies are represented including: Zebra Longwing (the state butterfly for Florida ), Monarch, Julia, Black Swallowtail, Cloudless Sulfur, Gulf Fritillary, and Painted Lady. Within the gazebo, along with the butterflies are more than 20 varieties of nectar producing plants for the butterflies to feed upon. These plants include: passionflower, coral honeysuckle, buttfly bush, blazing star, scarlet milkweed, canna lily, and Cape Royal plumbago. Guests of all ages enjoy going into the gazebo and seeing the all of the butterflies flying freely in such a close setting. This certainly brings out the kid in all of us. Epcot's 16th Annual Flower & Garden Festival runs from March 18th to May 31st. Make sure that you take the time to check out Minnie's Magnificent Butterfly Garden while you are there. There is a butterfly identification guide in the Festival Program that you can use to see how many different species that you can spot. 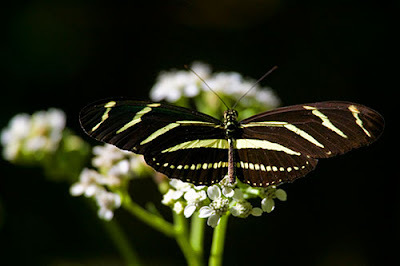 Amaze your friends that you now know the state butterfly for Florida is the Zebra Longtail (shown below) . Earn extra points for identifying it by sight. 0 comments to "See over 500 Butterflies Up Close During Epcot's International Flower & Garden Festival"